FREE STATE OF JONES is an epic action-drama set during the Civil War, and tells the story of defiant Southern farmer, Newt Knight, and his extraordinary armed rebellion against the Confederacy. Banding together with other small farmers and local slaves, Knight launched an uprising that led Jones County, Mississippi to secede from the Confederacy, creating a Free State of Jones. Knight continued his struggle into Reconstruction, distinguishing him as a compelling, if controversial, figure of defiance long beyond the War. Currently you are able to watch "Free State of Jones" streaming on Amazon Prime Video. 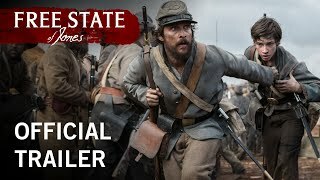 It is also possible to buy "Free State of Jones" on Microsoft Store, PlayStation, Amazon Video, Sky Store, Google Play Movies, Rakuten TV, YouTube, Talk Talk TV as download or rent it on PlayStation, Amazon Video, Microsoft Store, Google Play Movies, Rakuten TV, Sky Store, YouTube, Talk Talk TV online.